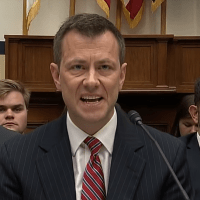 Agent Peter Strzok engaged in adultery with FBI lawyer Lisa Page. (Susan Jones – CNSNews) FBI Assistant Director E.W. “Bill” Priestap, the head of the FBI’s counterintelligence division, told investigators from the House Judiciary and Oversight Committees on June 5, 2018 that the FBI does not prohibit adulterous affairs. “There’s no FBI policy that says you can’t have an affair, and if you do, you’re going to be punished,” Priestap said, according to a transcript of the closed-door hearing. The transcript was released last week. Priestap told the committees he heard from other people that FBI Counterintelligence Agent Peter Strzok and FBI lawyer Lisa Page might be having an extramarital affair, but he never asked them if it was true, nor did he report it to the FBI’s Office of Professional Responsibility (OPR).